WOWZERS! Getting to Newquay just got so much easier A Direct Bus service from St Austell on Saturday 25th August! !… and a Newquay, Cornwall Rainbow train station. GWR has painted the town’s station in rainbow colours to support Cornwall Pride. GWR will give Newquay station a new-look to celebrate Cornwall Pride taking place during the August Bank Holiday weekend. Specially designed rainbow signs will replace the existing Newquay station signage along with the addition of colourful bunting stretching the length of the station platform. The train operator has teamed-up with First Kernow to ensure those wanting to attend the family-friendly celebration in the town can travel by train and bus with ease over the weekend Cornwall Pride is taking place. Extra buses have been arranged from St Austell to supplement train services into and out of Newquay and allow as many people as possible to join in the celebrations. Thousands of people are expected to pass through Newquay station to take part in the eleventh year of Cornwall Pride. GWR customers arriving in Newquay will be given specially designed ticket wallets with train and bus times. 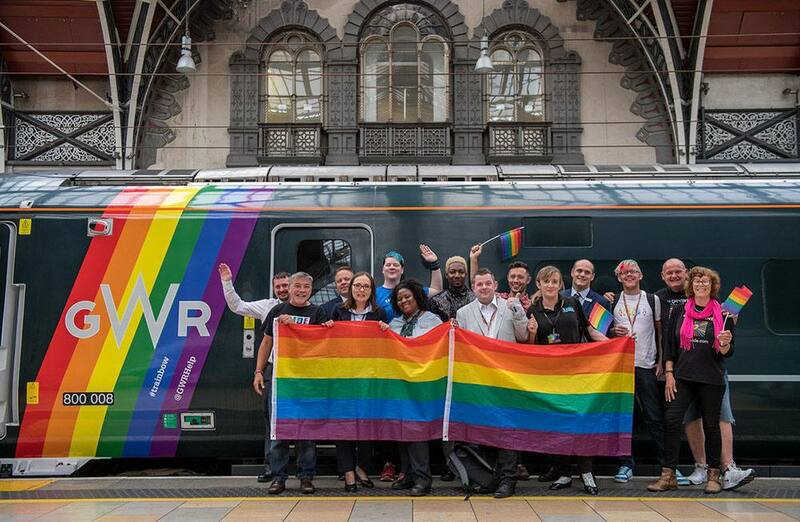 This year Great Western Railway has worked with more Pride events and organisations than ever before to help promote the summer of pride celebrations across the network. GWR was one of the first train companies in Britain to launch a special ‘trainbow’ liveried train earlier this year.